Musicians have all sorts of different reasons for making music. The creative desire, the blend of personalities, the gear choices and maybe even some attempt at making some cash from the endeavour, all come into play. Nestling amongst all these considerations, at the very heart, is a love of playing and generating sound. A chance to create a world that invites the listener to be immersed in the world they’ve created. And as part of this creative process, how do they want the audience to feel? Whilst music’s role might be to continually break new ground, it regularly does so by rejigging the past. It’s a balance between new and old. So, this newest release The Cave, in a way would be just fantastic if was more of the same. But whilst this new disc still retains all that I love about the band, it goes somewhere spectacular and new. Imagine a weird marriage between early orchestral Zappa, Ron Geesin informed Pink Floyd, Japanese synth quartet Space Ponch, cobwebbed spooky mode Broadcast, and a neon lit fairground on mushrooms… and you may well enter The Cave. The album wastes no time in throwing you into this strange space with the vast 20- minute opener Times Arrow. A massively entertaining mental pantomime that twists and folds countless times, humorously, grooving and sparkling with inventive touches. The track’s sheer scale completely draws you into a disorientating mist. The mellotroned climb down around the 10-minute mark gives way to a preposterous trumpeted groove which in turn blossoms into a jazzy hallucination. The music feels synthetic and horrible and still driven forward by this super cool forward momentum. The video game soundtrack to some 60s kids show or some multi-dimensional orchestral reimagining of something already overblown. The underlying theme keeps returning but every time is melted and reformed in a different way. Cumulatively, the music has slowly retuned your mind and ears into this bizarre carnival infused pysch. The second track opens, giving a sense, the entire album will hover around in the space initially mapped out by the first. After Fascination jumps through these hoops it fizzes out into a near silent ambient coda with strange robotic announcements, before climbing into a demented Lizard vintage King Crimson hall of mirrors finale. Some 26 minutes into The Cave, Cosmic Lie (The Quantum Man) has wonderfully displaced watery vocals (the first human voice on the album) and a low key psych groove that feels like a monumental surprise. The voice is stretched and fractalized in every direction like an even more whacked out Neighb’rhood Childr’n. Seemingly, what has come before only heightens the tugging spacey gravity of this track, which in turn, perfectly ques up the folky air of Black Sheep. It comes in like a Fairport Convention or Trees track that’s just been found in the vaults. Music that curls out the mist to reveal a beautiful understated momentum. Perhaps this is the most unadorned Worthless have ever been and it’s beautiful. The brief Wine Glasses feels like a refraction of the breathy vocal before realigning itself with the hooting fanfares earlier in the album. The final track Schele’s Green works through a twinkling glittering introduction before settling into a wonky keyboard figure. Finally, the whole thing erupts into a galloping carousel with sludgy brass before fading into silence. The first time I listened, after a lot of nodding and smiling I actually burst out laughing. My initial fly-though of the album sucked me in and held me there for 40 alien minutes. The whole experience is transportative. Countless albums broadly labelled as psychedelic rock don’t stray far from rock with faintly odd touches. Compared to way more championed stuff elsewhere Worthless create thoroughly unselfconscious drippingly imaginative head music. Granted, folk that get zapped in the crossfire of your speakers might think you’ve lost your mind but it’s a risk worth taking. 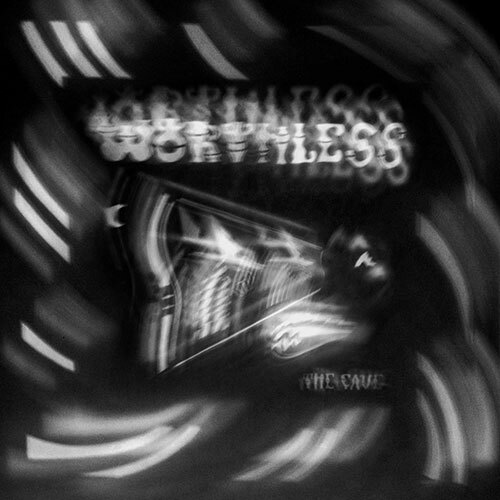 I have no idea where Worthless are aiming for but The Cave is another superbly inventive journey. “The Cave” is out now, available on vinyl and digitally.